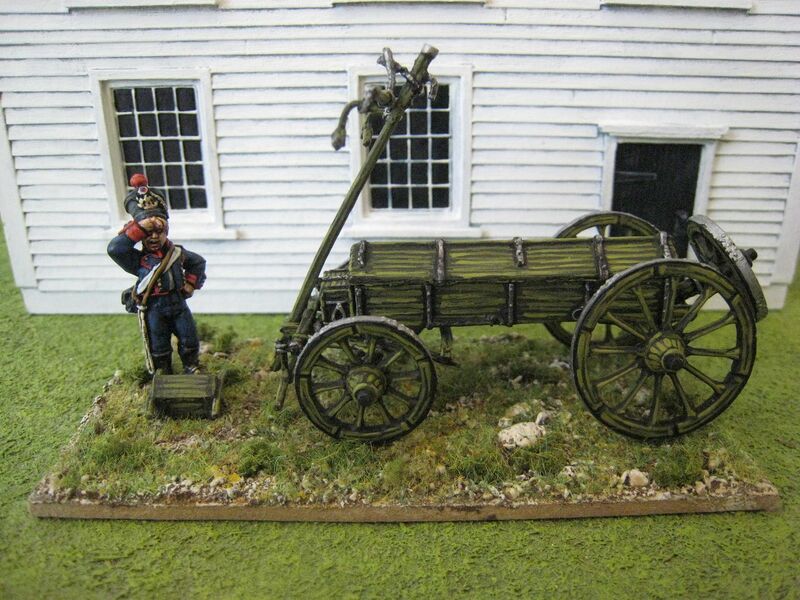 This the French Napoleonic caisson made by Westfalia Miniatures, with a Foundry artilleryman. I've posted some stuff from Westfalia Miniatures before (which can be found with this new label). 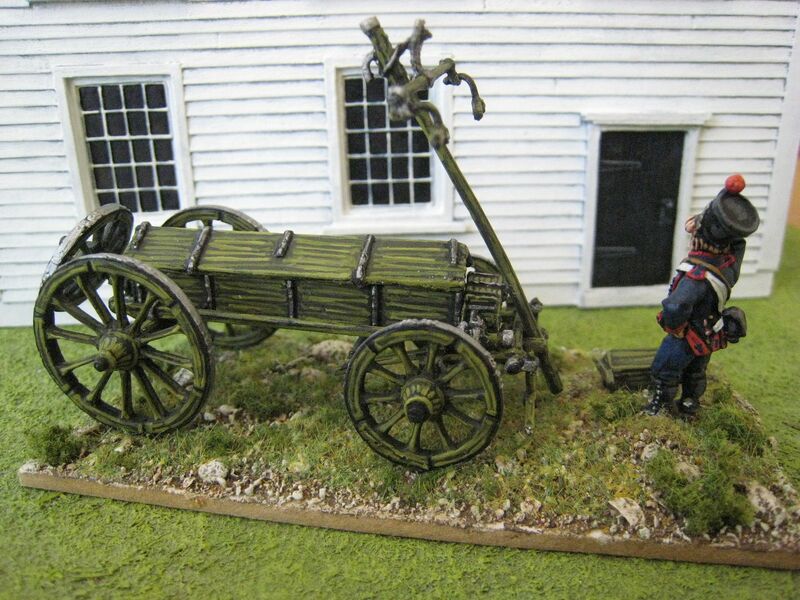 They produce a variety of off-beat Napoleonic figures and equipment, including a new later-war Saxon range. This caisson is just the thing to have behind a battery of French guns. It comes in about 10 different metal bits and, in the absence of any diagram or instructions, is a bit fiddly to put together. I had to rely on photos opf the completed model to work out where the bits went. Even so, I still found two pieces left over which I cannot place at all. That said, once you see where (almost) everything goes it doesn't take long to glue together. I had a think about what figures, if any, to add to the caisson. 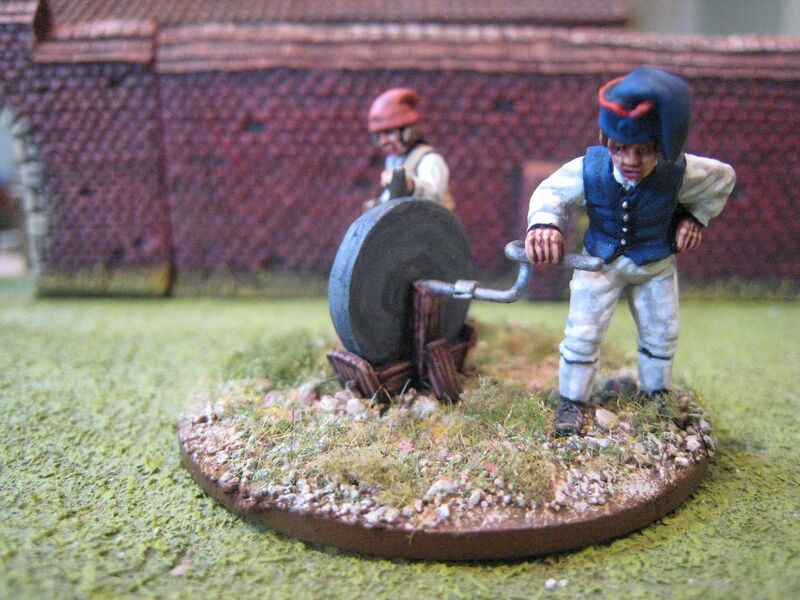 I originally thought about a couple of wounded Frenchmen, but then realised that a gunner fetching ammunition would be much more appropriate. 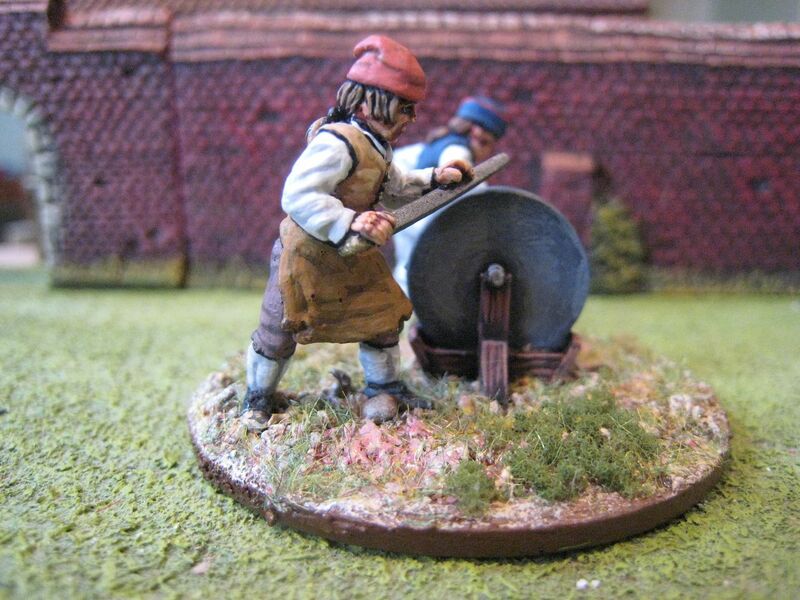 So I used an artilleryman from a Foundry gun crew set I painted in August 2010. I originally based this chap on his own separate base (the Foundry pack has 6 figures and I only base 4 with a gun). I had meant to order another pack, but forgot and so decided just to plonk this figure into the base. I like the way the pole on the caisson rather towers above him - it looks rather menacing. I painted the caisson while on holiday in Norfolk for a week at the beginning of the month. I had never taken painting stuff on holiday before, but I realised I wouldn't need more than 4 paints to do the caisson and a couple of other French cannon pieces. To recap on the paints used: for the artilleryman - Foundry palette "French Blue 65" with a final highlight of Foundry "Deep Blue 25B; for the woodwork of the caisson - base coat of Vallejo "Yellow Green" mixed with plain black, then first highlight of "Yellow Green" and second highlight of "Yellow Green" mixed equally with Vallejo "Dark Yellow". I did actually paint the inside in a nice pale wood colour, but the top is glued shut so that was a total waste of time! While we're discussing paints, in case anyone is interested, I paint my bases with an undercoat of GW "Steel Legion Drab" (formerly known as "Graveyard Earth") and then highlight first with Foundry "Base Sand 10B" and then with Foundry "Boneyard 9C". I've always made my bases quite bright, for a couple of reasons. First, I like my figures to "pop out" and brighter bases help that to happen. Secondly, unless you're in a forest or mud, ground colours are always lighter than you think, especially when viewed from a distance. 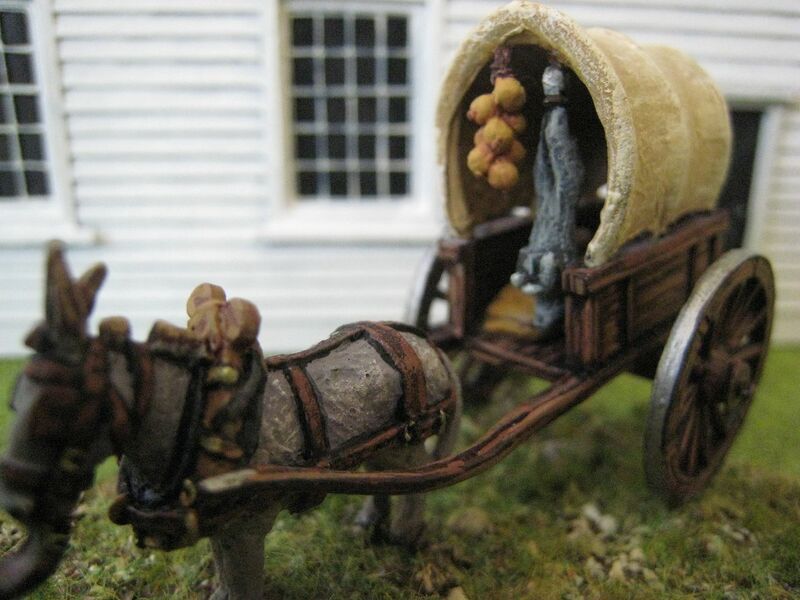 Westfalia Miniatures are available in the UK from Empress Miniatures, although I placed an order with the company direct without any problem (that was when they were based in Europe - I think they've moved to Canada now, so postage may well be quite a lot more now). This caisson costs £8. Foundry do a very similar one for £12. Easy decision! A caisson and an artilleryman. Painted August 2010 and July 2013. 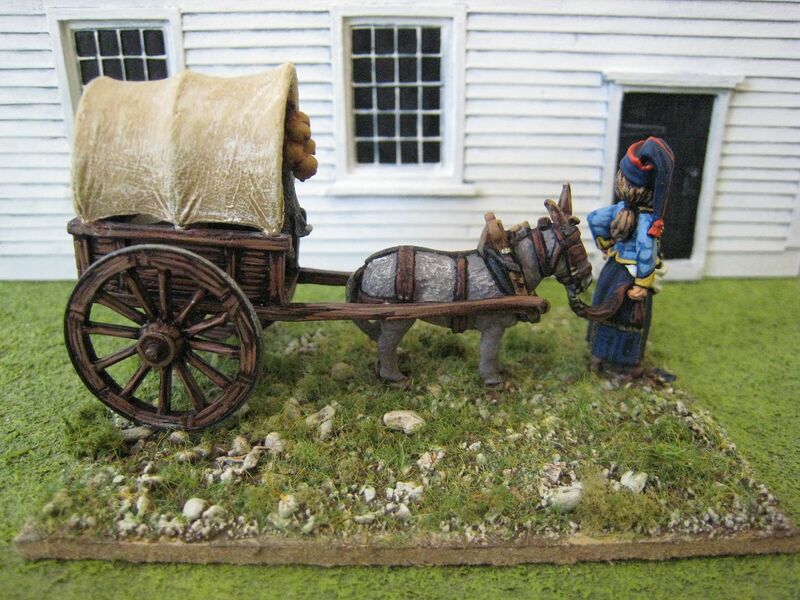 This is the last of the Eureka Miniatures French camp sets, a cantiniere with a provision cart. This is an all metal set, with lots of different bits of "provision": loaves, sacks, boxes, fruit, hams and various things the identity of which I haven't worked out yet. The cart is too small for all these items, which is handy because you can then use them for something else. I intend to find a table, a couple of suitable figures and make some sort of camp rations vignette. The canvas cover is separate so I suppose you could leave it off and just pile everything into the cart. I followed the pictures on the Eureka website and hung a rabbit and a string of onions from the top of the cover. As with all these sets, I wanted this to stand muster for both the AWI and Napoleonics. So with the AWI in mind I painted the cantiniere's jacket/dolman in the sky blue and yellow of Lauzun's Legion. I don't know whether this matches the colours of any particular Napoleonic hussar regiment, but I would be surprised if it didn't. I also painted the skirt in standard dark blue as opposed to any fancy tricolore stripes. 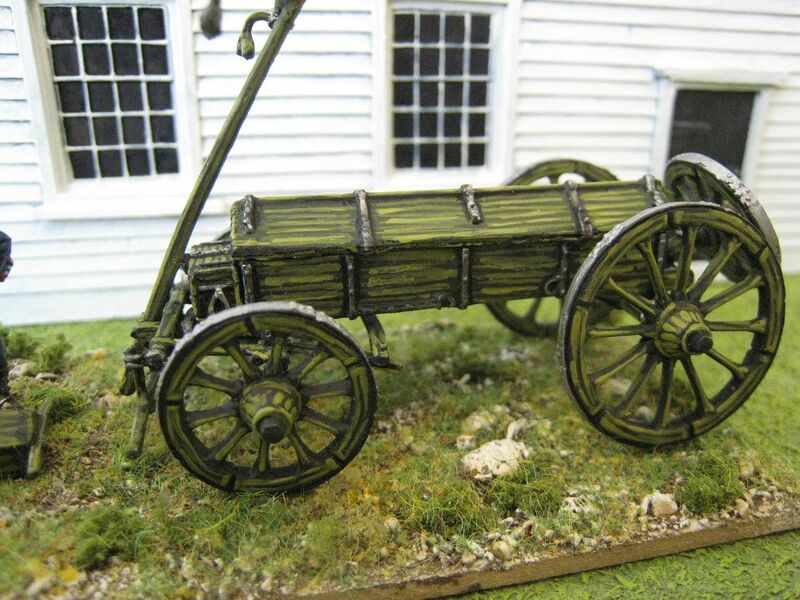 I decided to paint the cart in my normal wood colours rather than French artillery green. The cover is just Foundry "Canvas A" dry-brushed with the B and C colours. 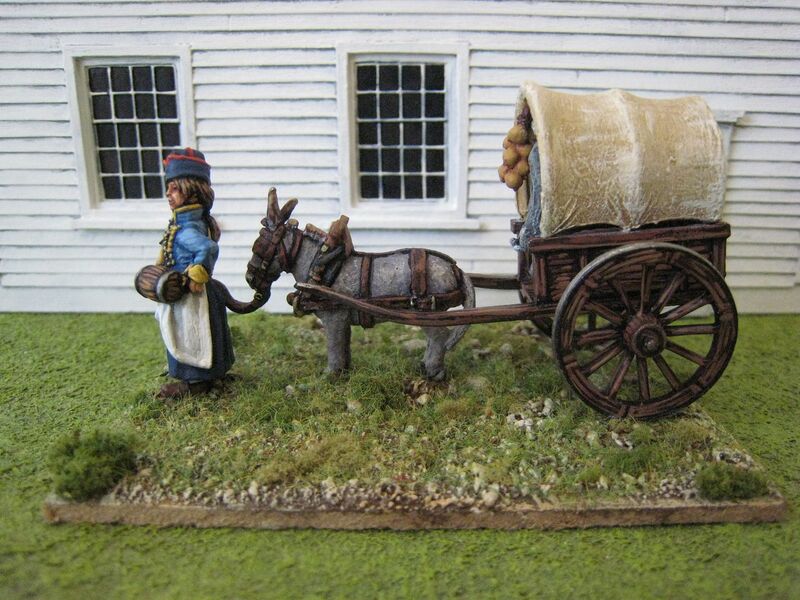 1 figure, a donkey and a cart full of stuff. Painted June 2013. 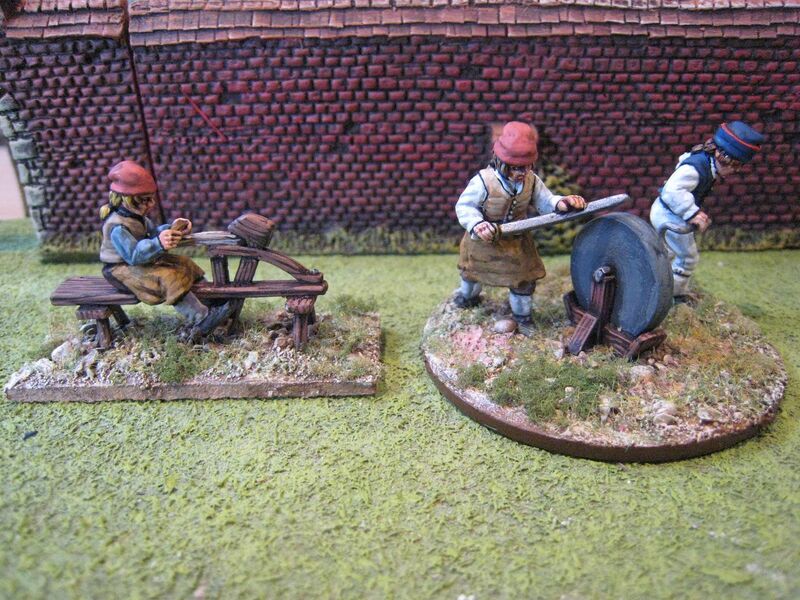 Here are the next two French camp vignettes from Eureka Miniatures: a sword sharpening team and a wheel wright. Again, I tried to paint these sets with both AWI and late Napoleonic use in mind. The chap turning the grindstone in the sword sharpening in supposed to be an artilleryman, which is why he has a dark blue waistcoat (unfortunately I forgot to give him dark blue breeches as well!). The other 2 figures are just supposed to be dressed in civvie clothes. There's not a huge amount more to say - the grindstone was painted with the Foundry "Stone" palette; the workers' aprons with Foundry "Leather"; the Phrygian hats with Foundry "Terracotta". These are nice little pieces that don't take up much table space and, in you don't mind the hats, are probably usable for anything from 1750 onwards. Next up is the cantiniere set, which I finished basing this morning. 3 figures, painted February 2012. I've been working my way through the 3 Eureka Miniatures "Wars of the French Revolution Camp Sets", with a view to using them for both Napoleonic and AWI games. 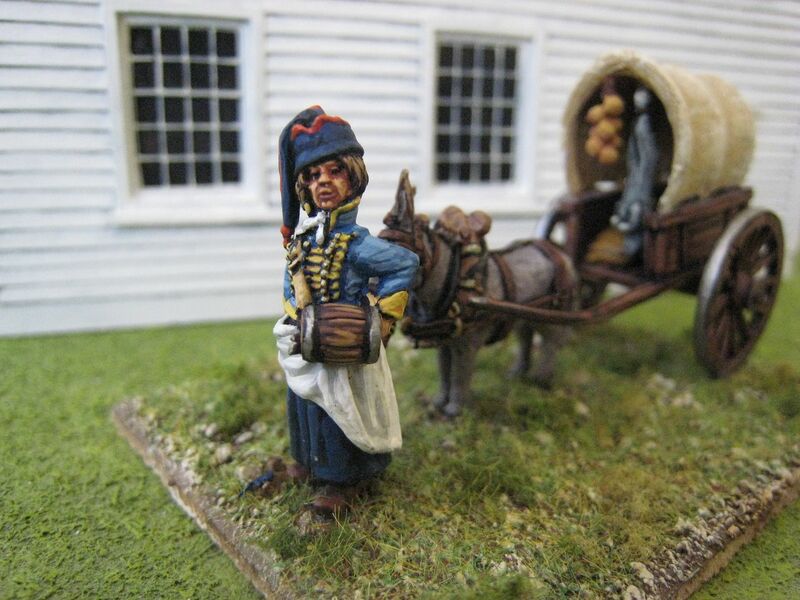 It takes a bit of chronological fiddling to squeeze these figures within the AWI and the 1815 campaign,because most of the men are wearing hats that are closely identified with the French Revolution, notably the "Phrygian cap" (otherwise known as the "Liberty cap" and the Smurfs' hat). In ancient times the cap was associated with the inhabitants of Asia Minor ("Phrygia" being part of what is now Asia-side Turkey) but was worn throughout the Greek and Roman empires. It is thought that the style was adopted by freed slaves, and that is how its association with liberty and freedom began. This of course reached its zenith wht the French Revolution. Apparently Napoleon hated the phrygian cap, in which case it is probably unlikely that tradesmen working with the army in 1815 were still wearing them by the time of Waterloo. Then again, who knows what they types of non-uniformed people wore. There doesn't appear to be a consensus on how the Phrygian cap came to be adopted by the French revolutionaries. It became a standard symbol or "revolution", and was worn by patriots in both America and France. One argument is that the French saw it being used in the Americas prior to the revolution; another that its use began in France and the cap was then exported to America. So there is some scope to argue that some people in America in 1781 might have worn this hat, perhaps early radicals whose ideas were flamed by the American cause for which they were fighting. To be honest, though, it looks unlikely that the cap was worn with revolutionary purposes prior to 1790. There are 3 vignettes in the range so far, with an indication that more will follow. 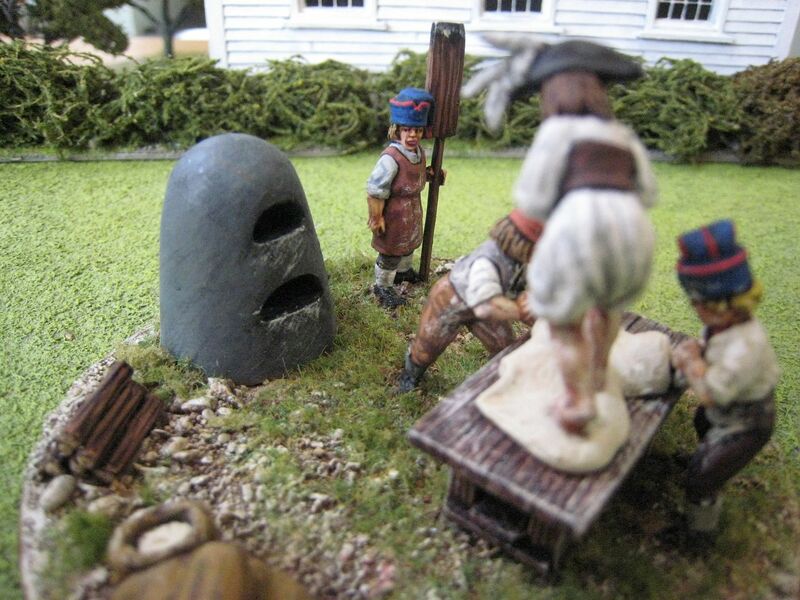 This first set is a field bakery, with 4 figures, a (resin) stone oven, a piles of logs andsome sacks of flour. The lady kneading the flour has pins in her feet which go through holes in the flour to attach into the table - this makes positioning everything very easy. It's clearly a well-thought out set. I wanted the bakers to look scruffy and covered in flour, so dappled them with a slightly off-white colour. I took inspiration for this from the excellent painted example on the Atelier Robin site here (I like his idea of another table with lots of loaves on it - might have to do one of those). The table itseld was painted with my standard dark wood palette - base coat of GW "Scorched Brown" (or whatever it's called now), wash of dark brown ink, then highlights of Foundry "Spearshaft" A and B. The oven was painted with the Foundry "Stone" palette - using the A base colour and then drybrushing with the B and C colours. If you were painting this as a proper Revolutionary War set, you'd probably paint the feathers in the woman's hat as a tricolore, but I left them white, as being more of an AWI French colour. The pokalems I decided to paint as normal - I don't know the extent to which this sort of hat was worn prior to the 1790s. So hopefully this is something that could be used in games that feature French encampments, such as Savannah and Yorktown, and so this set receives AWI and Napolenic French labels. There are two other vignettes which I'll post about soon. I've been on holiday recently and been subsumed by work; hence the lack of posts the past 2 weeks. I've enjoyed painting these sets and really hope that Eureka follow them up with more. 4 figures and various other bits. Painted March 2013.